The Church Council has decided to join area churches and others nationwide in proclaiming that Black Lives Matter. We will be displaying a banner with these words soon in front of the church to express our solidarity with others who share our concern for the basic dignity and rights of all persons. We too wish to join our neighbors on this issue. First Parish’s sign for Black Lives Matter was recently restored after being vandalized. Partly in response to this vandalism, Trinity Baptist Church posted its own signs in support of racial justice. Church of Our Saviour has also purchased a Black Lives Matter banner and will be displaying it as well. We have some thoughts on a couple of reasonable questions that people may ask about the Council’s decision. First, you may ask whether we might instead have the banner say “all lives matter”, because the heart of our Christian faith really is that all lives matter. Yet, the phrase “all lives matter” has been hijacked in the current national conversation to become the key alternative to “Black Lives Matter.” It has become widely understood as a way of saying, “Black lives do not matter”, so that is not the message we want on our banner. Second, you may ask whether the phrase “Black Lives Matter” is anti-police. Yet, as we considered how this phrase has been used in recent videos, essays, and protest speeches, we were fully persuaded that this rallying cry is rightly calling on police to seek to do justice in their work, and that it does not unfairly criticize the many police who already are doing God’s work of justice in our communities. We are confident that we can make clear the sign is not a put-down against police or anybody else. We felt the slogan succeeds in saying something positive about Black lives at a time when our nation is struggling with racism against Black people. The United Methodist Church has a long history fighting for social justice. At the national level, the General Commission on Race and Religion of the United Methodist Church (gcorr.org) has been leading the way on the issue of racial justice, organizing discussions and advocating for more concerted involvement by the church nationwide. We are compelled to reflect upon our own role in tolerating racism. Concerted reflection is itself a spiritual act. 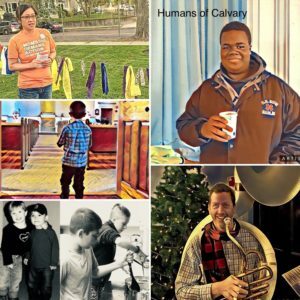 Many at Calvary have been engaged in concerted reflection in discussion groups, in community forums and in reading. As an outcome of this reflection, we are ready to do more. The displaying of a banner may seem like a small act, but it is an act of courage, a first step towards reconciliation.